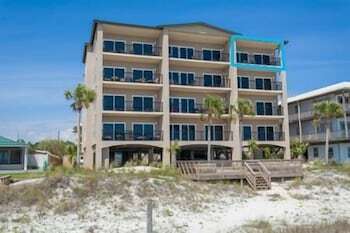 With a stay at this apartment in Mexico Beach, you'll be within a 15-minute drive of Mexico Beach and Windmark Beach. Free self parking is available onsite. Located in Port St. Joe, this apartment is a 1-minute drive from Windmark Beach and 10 minutes from Gulf County Welcome Center. Free self parking is available onsite. Located in Port St. Joe, this condo is a 1-minute drive from Windmark Beach and 9 minutes from Gulf County Welcome Center. Free self parking is available onsite. Located in Port St. Joe, this vacation home is a 1-minute drive from Windmark Beach and 9 minutes from Gulf County Welcome Center. Free self parking is available onsite. Located in Port St. Joe, this apartment is a 1-minute drive from Windmark Beach and 8 minutes from Gulf County Welcome Center. Free self parking is available onsite. Located in Port St. Joe, this condo is a 1-minute drive from Windmark Beach and 8 minutes from Gulf County Welcome Center. Free self parking is available onsite. Located in Port St. Joe, this apartment is a 1-minute drive from Windmark Beach and 7 minutes from Gulf County Welcome Center. Free self parking is available onsite. Located in Port St. Joe, this condo is a 5-minute drive from T.H. Stone Memorial St. Joseph Peninsula State Park and 10 minutes from Cape San Blas Lighthouse. Free self parking is available onsite. Located in Port St. Joe, this vacation home is a 4-minute drive from Mexico Beach and 8 minutes from Windmark Beach. Free self parking is available onsite. Located in Port St. Joe, this apartment is a 1-minute drive from Windmark Beach and 9 minutes from Gulf County Welcome Center. Free self parking is available onsite. With a stay at this vacation home in Mexico Beach, you'll be within a 15-minute drive of Mexico Beach and Windmark Beach. Free self parking is available onsite.